Former PNG Kumuls coach, Bob Bennett, told Radio Australia's Pacific Beat that Michael will be a success story for PNG,. 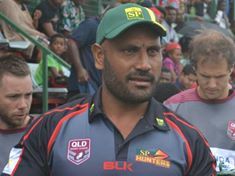 ​Led by coach Marum, the PNG Hunters finished second on the Queensland Cup ladder and narrowly missed out on a place in the Grand Final.Bennett said Marum had the "right attitude, discipline and management" to the job and could be a natural successor to take over from Mal Meninga as coach of the national side, the Kumuls. "When you look at the Samoans and the Tongoans and the Fijians, they are twice the size of the PNG boys, and PNG just get out and muscle. "But Michael will bring the discipline, he will bring the proper training, he'll bring the good ideas as far as coaching goes to them. "Whether they are good enough to win games with that, I'm not sure, but I don't think there is any other choice but Michael." Marum led Papua New Guinea to victory in the rugby league nines at the 2015 Pacific Games. The 42-year-old represented PNG in the 2000 World Cup and has also been involved in coaching the national team at the 2008 World Cup and 2010 Four Nations.